With my previous posts I have started a series of blogs that present my contributions to our ongoing TACCLE4-CPD project. 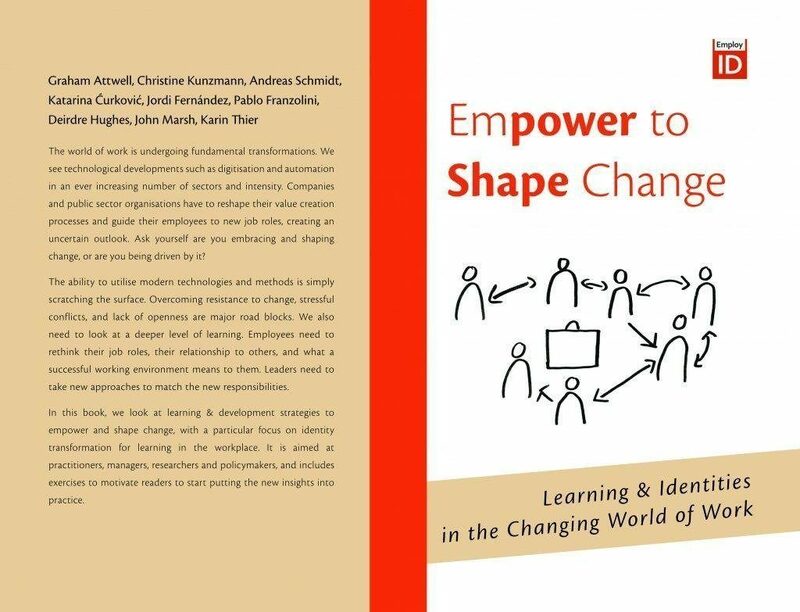 In this project we are looking at concepts and models for continuing professional development (CPD) of teachers and trainers with emphasis on promoting their digital competences. In my first post I reported on the document that I had produced for our policy analyses (with emphasis on the field of vocational education and training (VET)). In the second post I presented my starting points for revisiting our predecessor projects – the three earlier TACCLE projects with focus on classroom teachers and the Learning Layers project with focus on vocational and workplace-based learning. “Looking back at the project histories (of the predecessor projects) it becomes clear that the project teams have been able to ‘hatch out’ of the original scripts and face challenges that were not anticipated in the proposed work plans. Therefore, it is appropriate to consider the past training concepts as impulses for a future-oriented training approach – instead of taking them as ready-made models to be replicated. In particular this is important when discussing the value of the legacy of prior TACCLE projects and the Learning Layers project for future work in the field of VET. For the TACCLE projects the key instruments for promoting the teachers’ digital competences have been the TACCLE handbooks. The TACCLE courses have been closely linked to the preparation of the handbooks and to use of their contents. For the Learning Layers project (and its Construction pilot) the key instrument for promoting trainers’ and apprentices’ digital competences has been the digital toolset Learning Toolbox. The training campaigns that were implemented in earlier phases of work have served as preparatory phases. However, when looking at future-oriented training for trainers, the role of such toolsets as support for vocational and work process -oriented learning needs to be taken into account. In addition to the above-mentioned points it is necessary to consider the twofold meaning of ‘digital competences’ in the context of VET. As has been emphasised in recent studies (see Sloane et al. 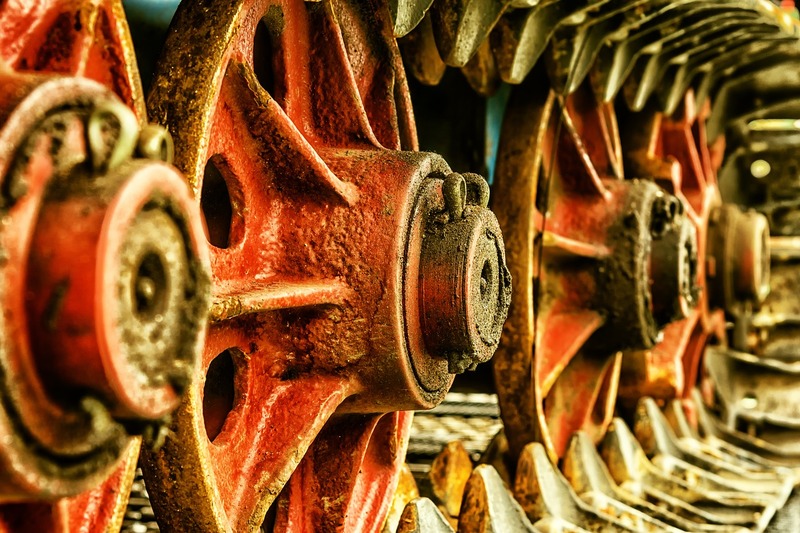 2019 and Gessler & Ahrens 2019), this concept refers to mastery of ‘digitisation’ at the operative level and to mastery of ‘digital transformation’ at the level of work processes at organisational level (and across production, supply and service networks). From this perspective it is appropriate to revisit the ‘theme room’ approach from the perspective of bringing together different training impulses and addressing different training needs with the help of different instruments to promote training and learning. So, I have taken the course to update the “Theme Room” model and to enrich it with newer experiences from the field of VET – in particular regarding the the use of digital toolsets like the Learning Toolbox and taking into account different meanings of ‘digital competences’. There is work to be done. With my previous post I started a series of blogs that report on my recent contributions to our ongoing TACCLE4-CPD project. As I mentioned, we are looking at concepts and models for continuing professional development (CPD) of teachers and trainers with emphasis on promoting their digital competences. In my previous post I reported on the document that I had produced for our policy analyses (with emphasis on the field of vocational education and training (VET)). With this post I want to draw attention to the predecessor projects – the three earlier TACCLE projects with focus on classroom teachers and the Learning Layers project with focus on vocational and workplace-based learning. The main point of interest for revisiting the prior TACCLE projects is to clarify, how the projects responded to the development of digital tools and web resources and how this was taken into account in the project activities. In particular it is essential to see, how the training activities provided impulses for shaping the successor activities of the on-going projects. The main point of interest in revisiting the Learning Layers (LL) project history is to give a picture of the multiple activities and different project phases. Here, it is essential to see, how the work in the Construction pilot grew together with focus on the development of the Learning Toolbox (LTB). When comparing the project histories of the TACCLE projects and the LL project, the main point of interest is to find out, how the training activities (alongside the project work) were related to the end products with which the projects were working. Here it is worthwhile to note the differences between TACCLE courses and the training campaigns during the LL project. In the light of the above-mentioned differences it is essential to have a closer look at the impulses for the development of a transfer-oriented training model that we can trace from different phases of the LL project. 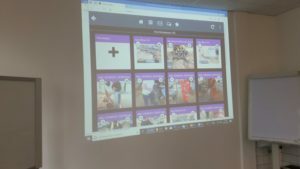 Here, it is equally important to have a look at the training/learning activities as well as the co-design and pilot testing of new digital tools. Finally, it is necessary to consider, how the TACCLE and Learning Layers projects have grown out of their initial scripts and responded to newer challenges that they have met during the project work. In particular it is essential to reflect, how the Learning Layers’ experiences on training the trainers and co-design of new digital toolsets have enriched idea of promoting digital competences. So, this is how I started my revisiting journey. In my next post I will summarise my interim conclusions. 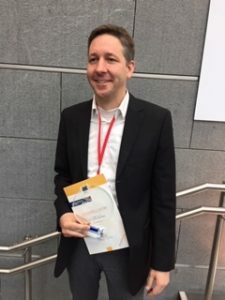 Some time ago we were pleased to announce the our EU-funded Learning Layers (LL) project had received the European VET Research Excellence 2018 Award in the context of the European Vocational Skills Week 2018 in Vienna. Now we have another reason to celebrate. Our former partners from the LL project who have continued the development of the Learning Toolbox (LTB) with their start-up companies have been successful. 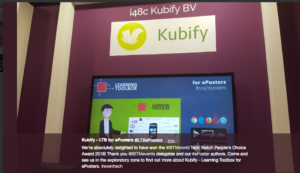 The start-up company Kubify that develops LTB for ePosters has won the #IBTMWorld Tech Watch Award 2018 at the international event of conference organisers. For us, the LL partners, who have been intensively involved in the co-design, co-development and introduction of LTB in the North-German construction sector, this is great news. Also, we are happy that we have piloted successfully with the ePosters at the European Conference on Educational Research (ECER) and in its VETNET section in Bolzano last September. However. 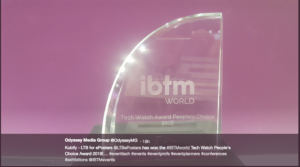 looking at the photos from the #IBTMWorld event organisers’ event – see below – we can observe that our LTB-developers have taken many steps forward. This award is richly deserved! Congratulations to the award winners and keep on doing the good work! We are very interested in continuing the good cooperation with you – with the LTB and with the ePosters. With my previous post I started to blog on the third transnational project meeting of our EU-funded project TACCLE4-CPD that took place in Pontypridd, Wales. This project is working with frameworks, pedagogic concepts and arrangements for continuing professional development (CPD) of teachers and trainers in promoting their digital competences. It builds upon the achievements of three previous TACCLE projects that worked directly with teachers and provided support for promoting their digital competences. The fourth project has the task to support training providers and managers in shaping adequate arrangements for CPD in different educational sectors and enhancing appropriate digital competences. In my previous post I gave a picture, how we revisited the key idea of this project and in what respect we have to face different challenges than the earlier TACCLE projects. The main difference is that we have to support policy-developers, educational managers and training providers – not immediately acting teachers and trainers. This has consequences for the policy analyses and frameworks to be developed in the project – as well as for our approach to collecting Open Educational Resources (OER). In general, we reached a common conclusion on giving a central role for our work with a Mindmap as an integrative tool. However, as I see it, this provided further challenges, how to link my contributions to this approach. In this context it is worthwhile to remind that the TACCLE projects have so far focused on general education (and general adult education). Thus, the emphasis has been on school-based education and classroom teaching. In this respect the field of vocational education and training (VET) with different institutional settings and with different interfaces between education and working life has not been present. As a contrast, our institute (ITB) had recently worked in a major EU-funded project Learning Layers in which we worked together with construction sector and with a training provider for work process -oriented learning. As a contribution to this project we had organised two campaigns for training of trainers to enhance their digital competences. In the proposal for the TACCLE4-CPD project this background had been highlighted as a major asset of our institute ITB in the current project. However, when the TACCLE4-CPD project started working, it became clear to me that I have to provide insights into the legacy of the Learning Layers project and what needs to be considered when discussing CPD policies and measures in the field of VET. Also, I noticed that there is a need to provide insights into the institutional complexity of the German VET system – in order to grasp the role of different policy levels and R&D programmes. In this respect I felt that we from ITB had to work ourselves in into the TACCLE4-CPD projects and that we had to open new perspectives for the project work. Below I illustrate this process with three key themes. Already in an earlier blog I had addressed the institutional complexity of the German VET system – with reference to the federal governance model and the dual system of VET (based on workplace-based training supported by school-based education). Taking into account the diversified power structures on education and training it is possible to understand the relevance of R&D projects and of specific sectoral partnerships. Therefore, I had produced for our November meeting a report that firstly gave a brief overview on the governance structures in education and training in Germany. Then I presented an overview of selected R&D projects that have a relevance for promoting digital competences and in shaping patterns of CPD. Thirdly, I included some interviews from actors in the field to highlight, what kind of impact different policies and initiatives have at the local level. When I presented this contribution, I realised that it was written in the old way as a national report. In the light of our discussion on the critical analysis of policies I needed to transform the perspective to a general approach to the field of VET. Then I needed to outline different systemic models and levels of policies – after which the German governance structures could be given as examples. In a similar way the level of R&D programmes should be outlined with some main themes – under which the selected cases should be given as illustrative examples. Finally, the engagement of actors in the field should be discussed in the light of lead initiatives and by presenting modes of participation. In this way the report would provide (to some extent) an introduction to the VET section in the MindMap and should also address, how the MindMap can be used. As a second contribution I had prepared a discussion paper that compared the project histories of the three earlier TACCLE projects and that of the Learning Layers (LL) project (with focus on the Construction pilot). In both project histories I noticed similar phases of search, reorientation and enrichment and encountering new challenges. From the perspective of LL project experience I emphasised the central role of Learning Toolbox (LTB) as an integrative toolset for supporting vocational and workplace-based learning. From this perspective there is a slight tension vis-à-vis the former TACCLE projects that focused on general school education and emphasised the role of teachers’ handbooks. When discussing this contribution I realised that I had not been able to reach the perspective of TACCLE4-CPD. Here, in addition to the work with the MindMap, it is worthwhile to take a look at the DigCompEdu framework as a bridging approach. Based on this framework it is possible to see the legacy of the LL project (including the co-design process, the training campaigns and the introduction of the LTB) as a systematic effort to link occupational competences, pedagogic competences and learners’ competences to each other. Here, the LTB served as a toolset that was shaped to support such integrative processes. From this perspective I needed to rework the paper to emphasise this approach and to avoid an impression that I would only be pushing the tool as such. A further important theme that we discussed was comparison of different training models. We noticed a general trend towards divisive grouping of training models as abstract lists. In our discussion we found it more appropriate to reinterpret such ‘models’ as ‘characteristics’ and to look, how different characteristics can be combined in holistic training concepts. From this perspective the “Theme Room” training that was used in the LL project would serve as an interesting case. In particular the prospect of further development of this concept – including the use of LTB during the training and after it – is an interesting challenge. I guess this is enough of these points. To some extent this brief report may appear as insider-discussion – given that the MindMap is not yet there as an illustration. However, to me it was important to write down my interim conclusions for further work in the project. The third European Vocational Skills Week (EVSW) took place this week in Vienna (Wien). The event has been launched by the European Commission to draw attention to the importance of vocational education and training (VET) for education, economy and society. Our European VETNET network has also played a role in drawing attention to the contribution of VET research to the development of VET. However, due to several intervening factors I have not been able to attend to these events. Yet, this time I was somewhat more engaged in the preparation and followed more keenly the news from Vienna. 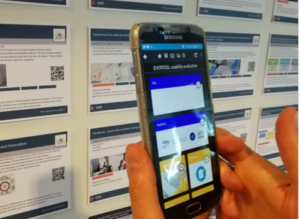 The Learning Layers (LL) project that carried out a complex Europe-wide R&D project for studying the use of digital tools, web resources and mobile technologies to support learning in the context of work. The project engaged application partners in healthcare sector (UK) and construction sector (Germany) in co-design, pilot testing and actual use of new tools. In the competition the project was represented by the scientific coordinator Tobias Ley from Tallinn University. The Modelling Vocational Excellence (MoVE) project is a transnational project that has studied World Skills competitions at the national, European and wider international contexts. The aim of the project is to draw conclusions from competition processes for the development of everyday life practice in the field of VET. This project was represented by the scientific coordinator Petri Nokelainen from Tampere University. After the nomination the finalists were presented on a special website for public voting that took place during the last weeks before the event and during the first two days. On the evening before the closing ceremony the finalists in different catergories had the opportunity to give short pitches to make their case. Then, in the closing ceremony the nominees of each category were invited and the winner was declared. 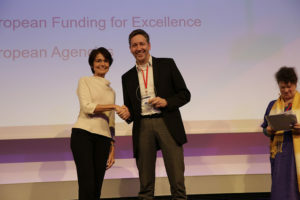 Concerning the award for VET Research Excellence I was pleased to see a video recording and to hear the words: “The award goes to … Learning Layers”. As fair competitors Petri and Tobias congratulated each other. 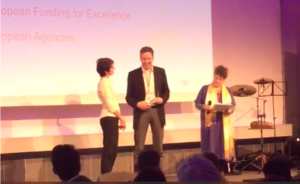 And then Commissioner Marianne Thyssen handed the award to Tobias Ley. Firstly, let us do justice to both finalists – the two international projects and the teams involved – and for the fair competition. This was a good way to present European and international VET research at such an event. A substantial part of Learning Layers pilot activities were carried out in the context of apprentice training for construction sector in North Germany. In this context the project was developing a digital toolset “Learning Toolbox” to support work process-oriented learning. Now, in the initial pilot context – the training centre Bau-ABC – the Learning Toolbox will be introduced to the training of all occupations. The co-design and tools deployment processes were carried out as participative Research & Development dialogue. In this dialogue practitioners, technical partners were developing tools that promote a culture of self-organised learning in different craft trades. The project organised training of trainers in such a way that they could act as promoters of innovation and adjust the use of tools to match their pedagogic priorities (self-organised search of knowledge within a wide set of resources vs. gradual extension of resources that are available for learner). The ‘theme room’ approach is being used in the further promotion of the tools by other trainers. After the end of the Learning Layers project there have been several follow-up initiatives to spread the use of Learning Toolbox to support practice-based learning in Vocational and Higher Education (e.g. in Estonia and Spain). These pilots have involved also other sectors (e.g. education/training in healthcare and media occupations). 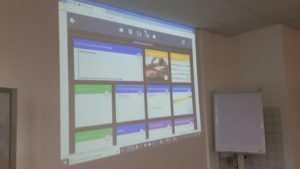 A major spin-off arising from the Learning Layers is the use of Learning Toolbox as support for ePosters in conferences. This was started in the conferences for medical and dental education (AMEE, ADEE) and in the conference for technology-enhanced learning (ECTEL). 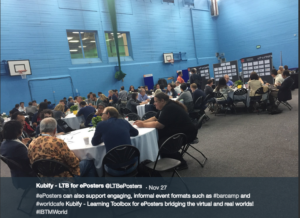 Most recently the ePosters were piloted in the European Conference on Educational Research (ECER) in the network for research in vocational education and training (VETNET). The points above make it clear that the Learning Layers project was not merely a theory-driven or a tool-driven project. Instead, the project took a high risk in launching open-ended co-design processes and was very much dependent on the cooperation with practitioners in the pilot sectors. Moreover, the tools that were developed in the project – notably the Learning Toolbox – reached the stage of viable products. But in order to bring them further as tools for regular use, additional efforts were needed by the tool developers, practitioners and supporting researchers. These efforts have pointed out to be successful and it was fortunate that reports on recent success were communicated in the event. Thus, the award was a recognition of all the work that contributed to our success. Now we can celebrate, next week we have to take further steps in our work. Posted in Informal learning, Knowledge development, Learning Layers, LTB-Blogs, participation, research, teaching and learning, TEL, trainers, workinglearning | Comments Off on And the Award goes to … Learning Layers! Last week I returned from my long sick leave. And I had immediately the possibility to attend a working meeting at the training centre Bau-ABC Rostrup. With this training centre we had worked in the EU-funded Learning Layers project many years to develop digital tools to support work process -oriented learning. During the project we reached the stage that Learning Toolbox (LTB) was ready as a viable product to support training and learning processes. 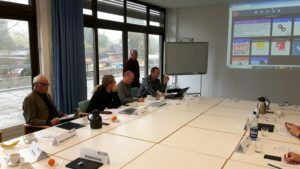 The pilot testing in the final phase of the project proved that trainers and apprentices can use the toolset in their training processes. Yet, there were several practical issues that slowed down a wider use of the LTB. Thus, the trainers that had been involved in the pilot testing kept on using the toolset but a wider use was delayed. Now, in our meeting last week we were facing a new situation. In the meantime most of the hurdles had been overcome and there was full confidence among all parties involved that LTB can be introduced in the apprentice training of Bau-ABC for all trades, Now the pioneering trainers, the management/administration representatives and the LTB developers were discussing, how to support a full-scale implementation of the toolset. From this perspective there was a need to harmonise the use of LTB stacks across the trades and to ensure effective ICT support. Secondly, there was a need to create awareness of good practice in different trades and to share experiences across the trades. In this context the presence of us – researchers from the research institute ITB – was relevant, since we are working in TACCLE projects that support training of trainers and we can draw upon the work in Bau-ABC. Pipeline-builders (Rohrleitungebauer) were using LTB to draft joint plans, how prepare the grounds for the pipelines. Instead of just doing the spadework individually, they made their plans as teams – they divided the tasks and allocated responsibilities for controlling. Road-builders (Strassenbauer) had prepared a comprehensive overview of the machines provided by the company W&N with nutshell versions of users’ guides (based on the original materials). Tilers (Fliesenleger) had prepared a comprehensive overview of technical tools that were used in their trade with links to the instructions provided by the manufacturers. Construction plant operators (Baugeräteführer) had prepared electronic forms as checklists for the inspection of the vehicles before starting to use them. Only after completion of the form and reporting that the vehicles were in order the operators got clearance to start working. Carpenters (Zimmerer) had been working in a joint project “WorkCamp GreenHouse” with other training centres in Germany. In the project they had developed several modules for ecological construction work (focusing on their trade and the use of materials). In this project they had used LTB as a common toolset and developed a common project plan structure to guide the creation of mother stacks and daughter stacks. 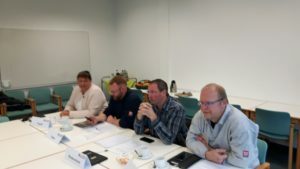 In the area “Health and Safety” (Arbeitssicherheit und Gesundheitsschutz) trainers from different trade had worked together to shape a common stack structure that presents the overarching regulations and the local instructions in the training centre. Within this structure different trades had the possibility to present trade-specific content (e.g. concerning their trade-specific personal safety outfits). In all trades the apprentices (Auszubildende) were using the LTB to upload photos as progress reports on their work and learning in the projects. The trainers used specific background colours for the tiles that documented apprentices’ work. If the points that I have listed above are taken only as separate inputs with dedicated tools, it would not appear very “revolutionary”. But the essence of the recent progress is that the trainers are working with an integrative digital toolset – the LTB. They have already used LTB for giving instructions and worksheets for apprentices’ projects. Now, with these newer features the range of using LTB in working and learning contexts is expanding. 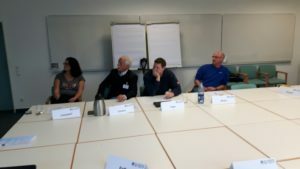 And – as already mentioned – the trainers are themselves leading the innovation and sharing experience with each other. Moreover, for the apprentices the use of LTB is not just a matter of receiving instructions and reporting of the completion of their tasks. As we have seen it from the examples, the use of LTB requires from them a holistic view on their projects and a professional attitude to completion of the tasks. This has been the spirit of working with the LTB in Bau-ABC. 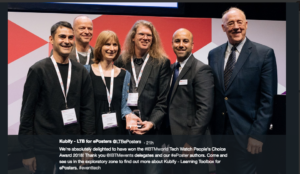 Now, at this stage we were happy to see that Bau-ABC is organising the wider use of the LTB independently of externally funded projects and within its own organisational frameworks – in collaboration with the LTB developers. And, moreover, Bau-ABC is looking for ways to spread the use of LTB across its professional networks. As we see it, the work of the Learning Layers project bears fruit! We – as accompanying researchers – are happy to observe this also in the future. This post is a continuation of my previous post in which I gave a picture of my long-term cooperation with Jenny Hughes who sadly passed away last Sunday. When discussing different themes I mentioned that I would get back to the TACCLE projects in a separate post. This was not only due to the fact that the TACCLE projects have been the flagship projects in Jenny’s career and their continuation proves that they have been a success story. However important this may be alone, another argument is that I have authentic video material in which Jenny reflects the experience earlier TACCLE projects and outlines her plans for forthcoming projects. This discussion was recorded for another European project (Co-op PBL in VET) in 2012 but it was reused and republished couple of times in the context of the Learning Layers project. The introductory text below is based on my earlier blog of April this year. Let us give the floor for Jenny with this adapted text and the videos! The series of TACCLE projects started with the first TACCLE project (Teachers’ Aids on Creating Content for Learning Environments) that worked in 2008 and 2009. It prepared an E-learning handbook to support the e-learning competences of classroom teachers. In the Taccle2 project the work was differentiated to address different subject areas and alongside them the primary education teachers. In the Taccle3 the emphasis on teaching programming and coding for school children. The project Taccle4 focuses on developing materials and media to support continuing professional development of teachers and trainers in different educational sectors. The most recent project – Taccle5 – focuses primarily on the field of vocational education and training (VET). As the following two interviews were recorded already in 2012, so the it was not quite clear, in what order the successor projects would come up, but the vision was clear – this work merits to be continued. As I have indicated above, the series of Taccle project was continued to a somewhat different direction than anticipated in the video interview above. The next theme (and target group) to be picked up after the subject teachers in Taccle2 pointed out to be teaching coding in primary schools (Taccle 3). This was a clear response to new educational priorities at European and national levels. The theme ‘continuing professional development of teachers’ (Taccle4) was an urgent need because the resources of Taccle partners were not sufficient to meet the demand for Taccle courses. And finally, the field of VET was taken up in the Taccle5 project. As we sense it from the videos, Jenny had put her heart and soul into the work in these projects. She learned a lot, how to bring these new competences to teachers in such a way that they became owners of their own learning. She also learned. how to meet the demands of the time. In Taccle1 it was necessary to work with hard copy book to get the teachers on board. In Taccle2 it was necessary to move to an online platform in order to manage the multiple contexts. In Taccle3 it was necessary to bring the coding specialists into work with teachers. All this required learning and mutual adjustment. As I have said it earlier, we have lost Jenny but we have learned a lot of her and we can work further in the same spirit.